Kentucky Obstetrics & Gynecology will let you know exactly what to expect when those important days of pregnancy are coming. Kentucky Obstetrics & Gynecology provides the best care in all gynecological procedures. All of our infertility care takes place off campus at the Kentucky Fertility Center. Please visit KYFertility.com for more information. 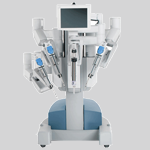 We use the latest Da Vinci technology for minimally invasive treatments.